Obesity in midlife has long been suspected of increasing the risk of Alzheimer’s. Researchers at the National Institutes of Health took a closer look and reported Tuesday that being overweight or obese at age 50 may affect the age, years later, when Alzheimer’s strikes. Among those who eventually got sick, more midlife pounds meant an earlier onset of disease.”Maintaining a healthy BMI at midlife is likely to have long-lasting protective effects,” said Dr. Madhav Thambisetty of NIH’s National Institute on Aging, who led the study reported in the journal Molecular Psychiatry. 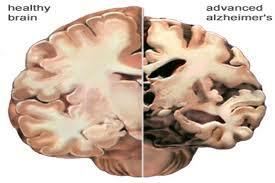 Alzheimer’s starts quietly ravaging the brain more than a decade before symptoms appear. With a cure so far elusive, researchers are hunting ways to at least delay the disease, and lifestyle changes are among the possible options.The researchers checked how much those Alzheimer’s patients weighed when they were 50 and still cognitively healthy. They tracked BMI, or body mass index, a measure of weight to height. Every step up on the BMI chart predicted that when Alzheimer’s eventually struck, it would be 6 1/2 months sooner.